Kroger is one of several big-name retailing stocks set to post earnings results over the next few days. 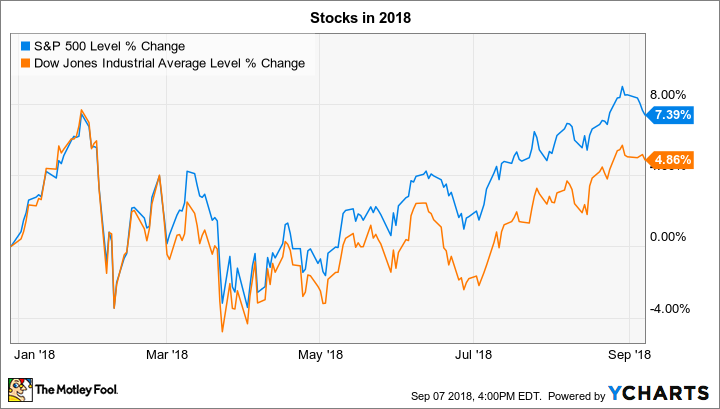 Stocks dipped slightly in a shortened trading week last week, but both the S&P 500 (SNPINDEX:^GSPC) and the Dow Jones Industrial Average (DJINDICES:^DJI) remain in solidly positive territory so far on the year. The week ahead promises volatility for a few retailing stocks that are set to announce their latest quarterly earnings numbers. Below, we'll preview what investors can expect to hear from Kroger (NYSE:KR), Dave & Buster's (NASDAQ:PLAY), and Tailored Brands (NYSE:TLRD) over the next few trading days. Men's formalwear specialist Tailored Brands will post its fiscal second-quarter results after the market closes on Wednesday. The stock has had a difficult few months despite generally solid business trends. Sales improved in the first quarter, after all, led by modest upticks in both the Men's Wearhouse and Jos. A. Bank divisions. Yet investors have chosen to push the stock lower as they're taking a cautious approach to the idea that Tailored Brands can engineer a robust rebound in today's challenging selling environment. Signs that this recovery is taking hold would include another quarter of positive sales growth, ideally across each of the company's three largest chains. Investors will be watching gross profit margin closely, too, since continued declines there would suggest pricing struggles. Tailored Brands will also provide important updates on its debt repayment plans this week, along with details on its hunt for new executives, as both the CEO and chief operating officer are leaving the business. Investors are optimistic about Kroger's upcoming results, which are set to publish on Thursday morning. The supermarket chain has enjoyed a full year of positive sales growth following a rare dip into negative territory in late 2016 and early 2017, and management is expecting these good times to continue. In fact, revenue gains are predicted to roughly double during the 2018 fiscal year. Meanwhile, strong customer traffic results from rivals including Walmart and Target suggest Kroger might lift that full-year forecast on Thursday -- assuming its business also benefited from the favorable economic trends that helped its competitors. As these peers did recently, Kroger warned investors to expect a period of lower profitability as it adjusts to the new multichannel selling environment. But that earnings pinch will be more modest if shopper traffic speeds up, so shareholders have good reason to expect positive news on both the retailer's top- and bottom-line trends on Thursday. Investors have big questions heading into restaurant and entertainment chain Dave & Buster's earnings release on Friday. These start with sales numbers, given that revenue shrank 5% at existing locations last quarter; trailing management's targets and putting the company on pace for its third straight year of worsening revenue trends. There were some bright spots in those most recent results, including solid profits from its new small-format store openings. However, Dave & Buster's is clearly struggling to stand out from the competition in both the food and entertainment sides of its business. In response, the company announced a management shake-up and a strategic shift that involves a menu revamp, marketing changes, and improved customer service. Brian Jenkins, in his first earnings report as CEO after having served as Chief Financial Officer since 2006, will update investors on management's progress on each of these goals on Friday. We'll also learn whether the strategic shift, and the generally strengthening economy, have allowed Dave & Buster's to return to customer traffic growth.